"Sometimes I wonder what the hell I'm doing in this business. It's all just one compromise and disappointment after another." I once read an article where musician Steven Tyler exclaimed that he found no humor whatsoever in his first viewing of the rock and roll satire This Is Spinal Tap. Tyler felt that the lampoonery of this lifestyle was too realistic, hitting too close to home to possibly be the slightest bit amusing. 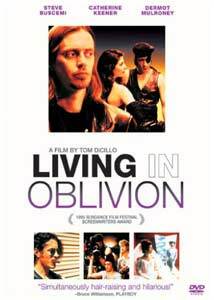 Budding independent filmmakers may experience a similar feeling of disillusion after watching Living in Oblivion, a film that humorously but painfully chronicles the pressures and disappointments of low budget filmmaking. Though irresistibly hilarious, the film is actually more of an ode to the heartbreak of independent filmmaking rather than a parody, a sly wink to all the struggling artists who have "been there, done that." As inspiration for this wickedly realistic send-up, writer/director Tom DiCillo drew from his own experiences in the low budget film industry and created an almost autobiographical tale of his frustrations. Originally penned as a half-hour short, DiCillo later structured Oblivion into a three-part, 90-minute film. While the first half hour is unquestionably the best sequence, the entire film works wonderfully as an hysterical exploration into the horrors and pitfalls of making a motion picture. A credit to the visceral power of the film, I actually found myself becoming as frustrated as the fictional filmmakers when one shot after another went awry. In addition to DiCillo's shrewd understanding of his subject matter, the film thrives on fantastic performances. From the main players to the supporting roles, all of the characters are wholly indicative of those I would expect to see working on a low budget film. At the top of the ladder is Nick Reve (Steve Buscemi), the frazzled director with big aspirations undermined by faulty equipment and a neurotic cast and crew. Buscemi masterfully portrays the bitter agitation of a struggling director, yet still remains sincere and appealing to the audience. Dermot Mulroney turns in a riotous performance as the cinematographer, Wolf, the type of egocentric "artiste" who unquestionably considers himself the most valuable on the set. Nicole Springer (Catherine Keener) and Chad Palomino (James Le Gros) are also exuberant standouts as characteristically unstable actors; Nicole is ripe with talent but plagued by insecurity, while Chad is a Hollywood big shot whose smug unpredictability turns the lives of the cast and crew into a living hell. Living in Oblivion is a movie based upon the disappointments of one thing after another going wrong. For 90 minutes, we watch these poor filmmakers endure just about every kind of problem possible. The film may sound dreadfully monotonous, but thanks to the keen sense of realism caught by DiCillo, there is never a dull moment. Unlike many fictional films, the best scenes are those grounded in reality; those that made me believe I was watching a real-life documentary on low budget filmmaking. In contrast, the moments when the screenplay resorts to unnecessary slapstick often feel silly and contrived. However, maybe these instances are also part of DiCillo's nightmarish memoirs. The bottom line is that this production is a thoroughly entertaining and successful comedy. It may not be a particularly profound film, but it is guaranteed to tickle just about anybody's funny bone�anybody with the exception of, perhaps, struggling filmmakers. Image Transfer Review: The 1.85:1 anamorphic widescreen image looks quite stylish. The first half hour, predominately shot in black & white, is intentional gritty and grainy, adding considerably to the mounting tension. I was amazed by how smooth and clean the color segments appear. Though somewhat soft, these scenes boast terrific detail and wonderful color saturation. While film artifacts are prevalent at times, they are never bothersome. Overall, there is very little to complain about. Audio Transfer Review: The monaural soundtrack is a perfect complement to this dialogue-driven film. Spoken words are distortion free and always intelligible. While I find that mono soundtracks often sound thin and strident, I was deeply impressed by the level of clarity and cleanliness offered by this impressive track. Extras Review: Easily the best of the special features, Tom DiCillo has taken time to record a heartfelt and humorous feature-length commentary. DiCillo reveals many interesting tidbits about both the production and the world of independent filmmaking. This is an excellent and informative audio commentary. The one deleted scene is bizarre, unfunny, and a welcome exclusion from the film. I am not sure where exactly this scene would have appeared in the grand scheme of things; perhaps it is merely a portion of a much larger joke. The interview with Tom DiCillo and Steve Buscemi consists of a candid Question and Answer session conducted at the Golden Age of Cinema Film Festival in 2002. The audience members, most of whom appear to be hopeful filmmakers, question the duo about a number of topics pertaining to Living in Oblivion and independent filmmaking. The answers are informative and revealing; however, I wish that this documentary were a bit longer, offering further insight into this unique production. Winner of a well deserved screenwriting award at the Sundance Film Festival, Living in Oblivion is a highly recommendable comedy. This parody of the filmmaking industry will leave most people hysterical with laughter, though aspiring filmmakers may find it an all too bitter portrayal of what really goes on behind the scenes.